True to its name, DK Eyewitness Travel Guide: Top 10 Andalucia & Costa del Sol covers all the region's major sights and attractions in easy-to-use "top 10" lists that help you plan the vacation that's right for you. This newly updated pocket travel guide for Andalucia & Costa del Sol will lead you straight to the best attractions these cities have to offer, from coasts to caves to museums and local shops. Find the best hotels, food, and attractions for every budget. Expert travel writers have fully revised this edition of DK Eyewitness Travel Guide: Top 10 Andalucia & Costa del Sol. + Brand-new itineraries help you plan your trip to these areas of Andalucia and Costa del Sol. The perfect pocket-size travel companion: DK Eyewitness Travel Guide: Top 10 Andalucia & Costa del Sol. 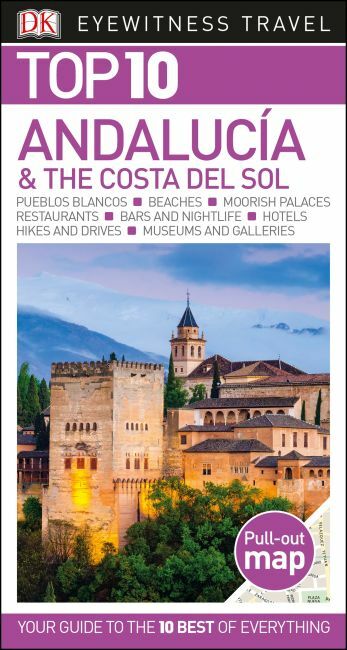 Recommended: For an in-depth guidebook to Andalucia and Costa del Sol, check out DK Eyewitness Travel Guide: Spain, which offers a complete overview of these cities; thousands of photographs, illustrations, and maps; and more.